The Everlast notebook by Rocketbook provides a classic pen and paper experience that is built for the digital age. Although it feels like a traditional notebook, the Everlast is reusable and connected to all of your favorite cloud services.. When you write using any pen from the Pilot Frixion line, your writing sticks to Everlast pages like regular paper. Use the Rocketbook app to scan your notes into editable documents and automatically save them to your favorite cloud services including Dropbox, Google Drive, and Evernote, to name a few. Rocketbook allows students to document their notes and illustrations in an efficient and environmentally-friendly way. 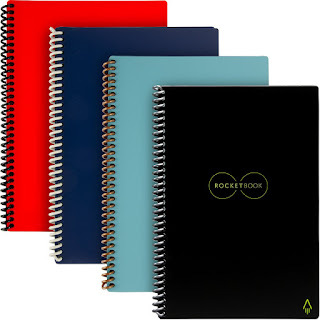 The Rocketbook Everlast is to be used only with a Pilot FriXion pen. The notebook has the same size and look of a regular notebook but there are dot grid patterns are on each page. Each page also has seven symbols on the bottom and a QR code on the side. 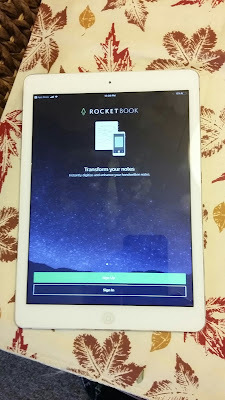 Before using the Rocketbook Everlast, you need to download the free app. Once the app is set up, you can set up your Rocket Symbols to create your own organization system for the notebook. For example, I may create one of the symbols to be used as my "Biology" folder in Google Drive. Logan is a sophomore in college and he's been using the Rocketbook Everlast. I was able to try it out first, but we set it up specifically for him. He takes the notebook to school and writes out any notes or reminders that he needs. He then has them sent to his Google Drive and emails. Once that info is digitally sent to where he wants it, Logan can erase the notebook pages and start all over again. The pen itself writes smoothly on the pages, and is erasable to get rid of any mistakes. The pages are erasable by dampening the microfiber towel with water and wiping the page, then drying it off with another part of the cloth. Because the pages are erasable, Logan can use this notebook numerous times throughout college. I would use it as a journal. 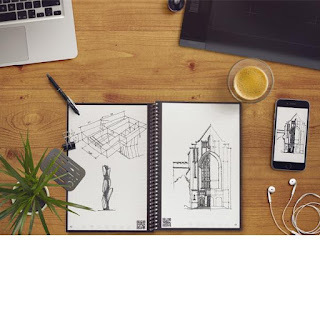 I would use the Rocketbook Everlast Notebook for drawing and as a planner. I would use it as a daily planner to take notes,I have a lot to keep track of. It's not hard to explain the benefit and purpose that this would serve if I was selected for the prize - as I discovered for myself when I recently had a medical situation that resulted in understanding my medical conditions. The moments leading up to it were me preparing to go to bed one night and get up the following day to get to an appointment (with a new doctor)! Perhaps this notebook would have served even more with that of notes needed / requested by doctors at some visits. Thus, I would use this (because I cant afford a laptop) to store appointments, lists and reminders! I would use it for my daily planner and grocery lists. I think that I would use this notebook mostly as a tool to help with my writing. It would be great for brainstorming, and for sketching out ideas and outlines. I would use this in our office meetings to keep notes. I would use this for many things. To make lists of things I need to do or need to buy. To write down appointments. Write down phone #'s. I would use it for science project ideas for my class! I would use this for making my lists of things to do for the day. I would use the Rocketbook Everlast notebook to take notes for my studies. I'd give this as a gift to a friend who would use it to take notes. I love using a notebook so would start this one off with all of my computer passwords and usernames. I would use it to take notes and as a weekly planner. I'd use it as a note-taking journal. I love making notes! Would use as a daily planner. I'm hoping to win it to gift to our 26 yr. old daughter who I know it would help a lot with her college work. She is SUCH a devoted only parent to her 1 1/2 yr old son, she works fulltime in the day, then puts her entire focus on him until he is asleep for the night, then she does full-time college online working toward her degree in business while he is asleep at night and gets to sleep very little and sometimes not at all, herself. Somehow she still manages to have gotten ALL 4.0's and is now on the honor society! We are incredibly proud of her! I see her doing a lot of work on her laptop and I know she does some even on her cell phone when she gets a lunch break at work, but I also see her writing a LOT Of handwritten notes on paper notebooks and so I believe THIS would be much more helpful to her than just paper notebooks and she loves to be organized to so I bet she would use it for lists and other things too. I would use it to take notes and write lists. I would use it for my daily activities that need to get done. I would definitely give this to my son to use as a sketchbook. It is good to have a sturdy book for sketching since it gets a lot of use. I will give this to my son to use for his classes. I would use it for meal planning and lists. I would give this to my daughter to sketch in. I'm the volunteer and adoption coordinator for a cat rescue shelter. This would be so great to help me organize everything I juggle! To-do lists, events, names/numbers of volunteers, fundraisers, etc. Oh boy! Fingers crossed!!! I would journal about my kids! I would use it in a lot of ways. We have a small business and I think this would be really nice to have. I would give this to my son for him to use in his Art class! I would use it to take notes and make lists. I would use this as a homeschool planner and to keep track of appointments. I'm such a list person, but usually I end up writing on scrap pieces of paper, which get lost, thereby not helping my organization whatsoever! I would use this notebook to help keep me on track day to day. I'd use it for taking notes! I would use it to make a honey do list. I would use this notebook for to do lists or maybe daily affirmations. I'd use it for my To Be Read lists in all the different categories I have. If I won this, I would give it to our daughter. She has 5 week old and 22 month old daughters and is finishing up her maternity leave. This would be very helpful for her when she returns to work for business related notes, lists, and tasks. I think it also would be helpful for her to keep all her Mom and family related home and health information together. I would actually give it to my daughter who loves sketching and writing. I'm a big recycler and I love this idea to cut down on our paper usage, plus the organization. What a win win! I would probably use it as a planner and for making lists. I would use it for listmaking. I would use this awesome notebook to make lists and to plan out my week. I actually write poems and take notes about life on a daily basis. I would love to have this to use it. 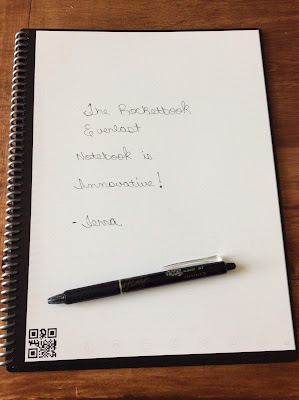 I would use the Rocketbook Everlast notebook to take notes. I'd use it as a journal!